Home > Blog > David Spero > How Serious Is Prediabetes? According to the American Diabetes Association (ADA), over 84 million Americans had prediabetes in 2015. But how big a problem is prediabetes? 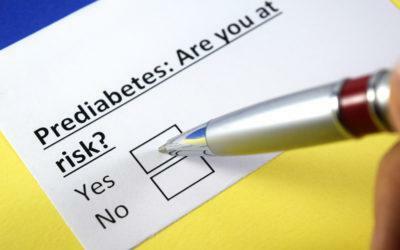 Is prediabetes a real disease? Or are they just trying to scare people, sell medicines, and get more money for diabetes services? Let’s see. Prediabetes is a numbers game. There are no symptoms that define it. The term “prediabetes” classes people with only slightly high sugars as having an illness. Some experts strongly dislike the term, because it sounds like a stage on the way to diabetes. It can be, but many people never get there. It depends on your life and how you live it. • Impaired fasting glucose (IFG): A fasting blood glucose between 100–125 mg/dl (5.6–7.0 mmol/l). • Impaired glucose tolerance (IGT): An oral glucose tolerance test (OGTT) result from 140–199 mg/dl. The person is given a sweet drink and his glucose is tested one and/or two hours later. An OGTT was the first test used to diagnose prediabetes, but it’s used much less now because of the time, difficulty, and expense involved. • Hemoglobin A1C: An HbA1c level of 5.7% to 6.4%. HbA1c is a rough measure of a person’s average glucose over the last 2–3 months. Some of the increased number of people with prediabetes is from the newer tests. More people are being tested, the cutoffs have been lowered, so more cases are being found. But what is the significance of these numbers? According to Australian health professionals writing on this website, IFG may indicate insulin resistance in the liver, so that it pours out too much glucose at night. IGT may mean there is not enough insulin or it is not working well enough to handle a large meal. Elevated HbA1c could be either one or both of these. People with prediabetes have been found to have 10–20% increased chance of heart attack or stroke than people with normal blood sugars. That is not a huge difference, but the higher the glucose numbers, the more risk. Some doctors think prediabetes is very dangerous. “Pre-diabetes is not ‘pre’ anything,” says Dr. Mark Hyman, MD, author of The Blood Sugar Solution. “It is a deadly disease.” Dr. Alan J. Garber, MD, PhD, FACE, who helped develop guidelines on treating prediabetes for the American Association of Clinical Endocrinologists (AACE) says that a prediabetic person’s risks for eye, kidney, and nerve damage, as well as heart disease, are nearly as great as those of a person with diabetes. The degree of cardiovascular risk seems to depend on other elements besides blood sugar, though. Factors such as high blood pressure, high cholesterol, lack of exercise, and stress, may contribute as much or more to one’s risk as glucose level does. Some damage seems to start in the prediabetes range. This study from the University of Toronto found clear signs of neuropathy (nerve damage), similar to those in new-onset Type 2 diabetes, in people with prediabetic glucose numbers. Painful neuropathy is often a first symptom of Type 2 or of prediabetes. The AACE says that, as of now, no medications have been approved specifically for treating prediabetes. However, they list many glucose-lowering drugs to consider prescribing off-label, including metformin, acarbose, GLP-1 agonists, TZDs, and insulin glargine. The AACE also lists the weight loss drugs orlistat and phentermine/topiramate extended release as treatments for prediabetes. People may be stressed and stigmatized by a diagnosis of prediabetes. They may find it harder to buy health insurance or possibly to get a job. Overtreatment of a condition that isn’t even a disease can cause its own problems. The scariest thing for me is how prediabetes is being identified with weight. Every website you go to, from professional organizations like AACE or ADA, to news organizations like CNN, to medical sites like WebMD, lists “lose weight” as one of the most important things you can do. Yet we know that sustained weight loss is rare. Focusing on weight can distract from focus on healthy behaviors. On the plus side, a label of prediabetes can be a wake-up call and get people moving more, stressing less, not smoking, and eating healthier. You might also explore alternative approaches you can find on our site and others. Nutritionist Amy Campbell wrote about ways to reverse prediabetes here.